In most of the Indian cuisines, pickles are an unavoidable side dish along with the main course. Mostly Indian pickles are made with vegetables and fruits accompanied with fresh spices. And for all non veggies,,...we can also make pickles with fish, meat, shrimp and chicken. South Asian Pickles / Achar are made with a wide variety of vegetables and fruits. Pickling is a kind of preserving veggies and fruits which are abundant in seasons for the future use. In most of the countries like US, Canada, Australia, New Zealand the word pickling refers to the pickled cucumber, pickled onion, a kind of chutney and so on. But in India, it's entirely different. Most of the Indians use spices along with the vinegar and salt which is all enough as a side dish along with some hot rice. My husband loves seafood pickling. 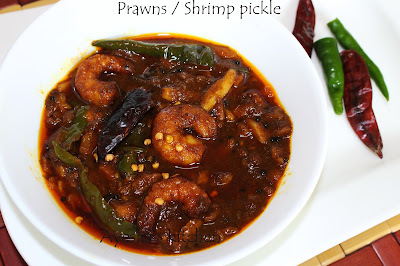 So i used to make pickles with prawns/shrimp when it is abundantly available.A very perfect combination with boiled rice. This is my mom's recipe for seafood pickles. 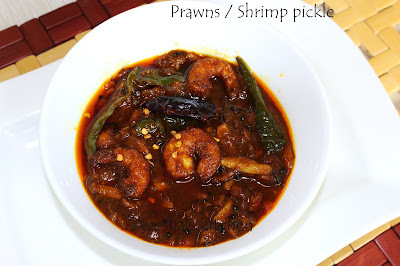 So let's see how to make a fantastic delicious hot fiery prawns/shrimps pickle. Really, a great yummy dish with Prawns/shrimp / chemmeen / konju. After 2 days, it is better to keep refrigerated for long use. If the climate is hot and humid, refrigeration of any pickles is strongly recommended. Clean and wash the prawns well. Marinate the prawns with 2 tsp of coriander powder, 1 tsp of turmeric powder, 2 tsp of chili powder, 1 tbsp of vinegar and salt. Keep it aside for 30 minutes and fry it until crispy. Strain it and dry the prawns by keeping over a tissue. Now heat oil and fry ginger and garlic. When done transfer it to a plate. Then add some curry leaves and the green chillies. Fry it and transfer to the plate. Now splutter mustard seeds, add fenugreek seeds and dried red chilli. Make the flame very low. Saute for a while and then add 1 tsp coriander powder, 2 tbsp chilli powder, Asafoetida and a pinch salt. Mix well. Mix in the sauteed garlic, ginger, green chilies and curry leaves. Mix well and add 4 tbsp of vinegar along with less than half a cup of water to it and brings to boil. Check for salt. When the water dries out and becomes thick, add the fried prawns and mix well. Cook well for few minutes or until the oil separates. Once cooled, check the taste and then add the remaining vinegar if required and mix well. Transfer it to a dry ( glass is preferred) container and store in a dry place. This pickle can be enjoyed the same day but for the best result use after a day.